Thursday June 18th 1896 I went down the first thing after breakfast and hoed the garden all over. I then did up my morning work and got dinner. Will hitched Old Pet for me and I went to Mrs Kuntz reception from three to five. I got home in plenty of time to do the work. Friday June 19th 1896 I baked a cake for the social this morning and did some baking for ourselves. I then got dinner. In the afternoon I took my things and went to the society meeting at Mrs Sawyers. I was put on the entertainment committee for the next year. Mary Woolf was thee and we ate lunch together before I started home. weather very warm again. 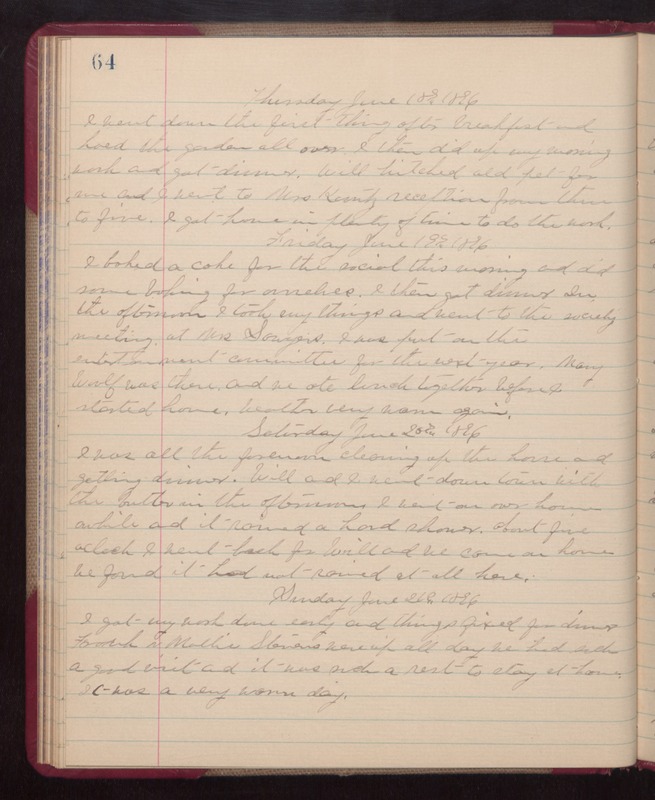 Saturday June 20th 1896 I was all the forenoon cleaning up the house and getting dinner. Will and I went down town with the butter in the afternoon. I went on over home awhile and it rained a hard shower. About five oclock I went back for Will and we came on home. We found it had not rained at all here. Sunday June 21st 1896 I got my work done early and things fixed for dinner. Frank and Mollie Stevens were up all day. We had such a good visit and it was such a rest to stay at home. It was a very warm day.